I wrote a blog post about a chess player named Hikaru Nakamura who was penalized for breaking a rule in chess a few weeks back and something happened yesterday that painfully illustrates the old adage that life just ain’t fair. In that case Nakamura moved his piece, took his hand off of it, and then tried to further move it. His opponent, Levon Aronian, immediately called this a violation and Nakamura was forced to put his piece on the original square. This cost him the game. Tough but fair. Them’s the rules. Or are they? Nakamura just finished playing in the United States Chess Championship where he finished in a tie for second place. 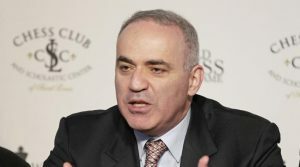 After the match the tournament scheduled a special Blitz Chess match between the top three players in the tournament and legendary chess player Gary Kasparov. Kasparov is 53 years old and has been largely retired from chess competitions for the last ten years. He is considered one of the greatest players in the history of the game and some consider him the clear best. That, of course, is debatable. Well, why today’s blog? Because in a Blitz matchup against Nakamura; Kasparov did exactly the same thing as Nakamura did in his match against Aronian. Nakamura saw him do it and a wry expression came across his face. Why? Because he was totally screwed. If Nakamura called the legendary Kasparov for the rules violation, everyone is going to consider Nakamura a bad guy. While there is a fairly large amount of money available to the winner of the Blitz tournament, it is largely an exhibition for fans to watch one of the all time greats take on some of the best United States players of today. If Nakamura doesn’t call Kasparov then he is throwing away an important advantage. Well, Hikaru, I don’t have to tell you, life ain’t fair. That is today’s lesson people. Sometimes you have to give life a wry smile and move on. I feel for you Hikaru. At least this one blogger thinks you made the right call, however, if it happens again, throw down the hammer!! An absolutely fascinating case was decided by the Supreme Court this week. This case demonstrates why I find law such an intriguing subject. A fellow named Jeffrey Hefferan was demoted from his job as a detective in the Paterson, NJ police department after he was spotted picking up a political sign for an opponent of the sitting mayor. Said mayor was friendly with the police chief. It’s clear this action is unconstitutional. You cannot punish an employee for expressing a political preference for one candidate over another. However, believe it or not, that’s not actually what happened. Hefferan was picking up the sign for his mother. He was not expressing a political opinion as is his First Amendment right. He was demoted not for political speech but by mistake. Therefore being demoted wasn’t unconstitutional, or at least that’s the argument the city of Paterson made before the Supreme Court. The court ruled 6 – 2 in favor of Hefferan. I agree with the court and let me explain why. The two justices who dissented, Justice Thomas and Justice Alito, agree with the city of Paterson because Hefferan wasn’t demoted for his protected First Amendment rights, he was demoted by people mistakenly believing he was expressing said rights. This is an insistence upon a Strict Constructionism interpretation of the Constitution. If we are to take the Constitution for its literal meaning instead of its intent then Thomas and Alito are correct in this case. I argue that the point of a law is its intent. The question Strict Constructionists then demand is: Who determines intent? Judges, that’s who. That’s the whole point. The written word is always going to fall short of the intent of the law. I certainly don’t like judges who interpret in a manner that expands the Constitution beyond what I consider reasonable but I cannot indulge in the intellectual deceit that there is no such thing as interpretation. Every case is based on interpretation of ambiguous words. Alito and Thomas rely on volumes of interpretation of the First Amendment. Is a political sign actually Freedom of Speech? Speech literally is the spoken word, not the written word. It has long been interpreted to mean the written word but that’s not the literal meaning of the Free Speech section of the First Amendment. Congress is not passing a law of any kind in this case. A local law enforcement agent demoted a subordinate. A Strict Constructionist must agree that any government official can fire anyone for their political beliefs at any time. By this logic a state could pass a law making being a Democrat, Republican, or Libertarian illegal. They could imprison those who dissent. After all it is not Congress passing said laws. We must always consider intent, even if that interpretation is wrong at times. 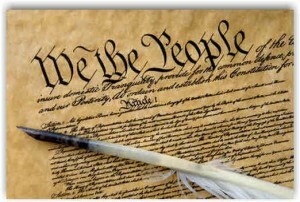 It we insist on Strict Constructionism the Constitution becomes a worthless piece of paper. Of course Hefferan was demoted for his political opinions. His political opinions were mistakenly identified, that’s true, but the underlying reason he was demoted remains clear and unmistakable. The Constitution guarantees that we can speak our political minds and not be punished by the government for so doing, even if the wording does not explicitly express such. Hefferan works for the government. He cannot be demoted for either expressing his political opinion or by someone who mistakenly thinks he is expressing his political opinion. They are one in the same. Is it Okay to Root for Nazi? The annual United States Chess Championships, both men’s and women’s divisions, are being held at the Chess Club and Scholastic Center in St. Louis for the next few days and the aforementioned woman is a leading contender for the title. Let’s all admit it, when we see the word Nazi certain things come to mind. We cannot deny this bias against the word. It has a meaning far beyond her name. When I heard her name at last year’s championship the first thought I had was: She would be wise to change it. I’m not proud of that thought, I’ve come to the conclusion that she should use her name proudly. She has nothing to do with the definition we generally associate with that word. She is a young woman who is an excellent chess player and, by all accounts, a great role-model for young girls everywhere. It does get me to thinking about the unconscious biases we have in our daily lives. If I was robbed by a person who wore a red shirt then when I see someone in a same colored shirt I become slightly afraid. If I was in a car accident caused by a someone driving a particular make and model of car then when I see a similar car I immediately become more alert. It’s certainly not fair to the person in the red shirt or the driver of the other car but it is unquestionably true, much as we might like to pretend it is not. We cannot avoid such biases for we are human and we have lived. Things have happened to us. Events and people harmed us and we associate said events with what the person was wearing, the color of their skin, their religion, their sexual orientation, and any myriad of other things. The reality is that we must judge people by their actions, not the color of their shirts, their names, or any other superficial feature. Such a world is the one we Libertarians yearn to live upon and yet I am as susceptible to such biases as anyone else. My point? I’m not sure. I guess I’m saying that I’ll be trying to overcome such thoughts and I hope you will as well. There’s a fairly big story in the news about a company called Theranos and its founder, a woman named Elizabeth Holmes. Holmes founded Theranos based on the idea that they could perform accurate lab tests with a few drops of blood, using a secret test called Edison, when before it took vials to do the same thing. The promise of such tests and the charisma of Holmes was enough to attract over $800 million in investments. The original claims of Holmes, who attended Stanford in an attempt to get a degree in Chemical Engineering but dropped out, were met with skepticism by the medical community but that didn’t stop hopeful investors. 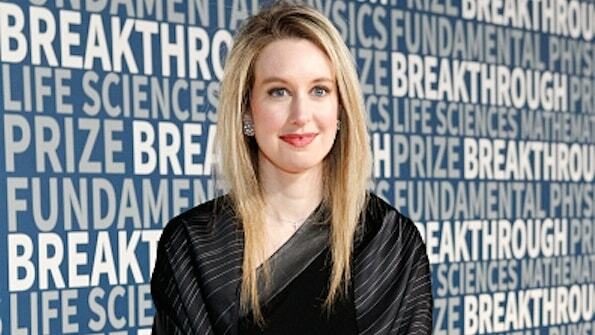 Theranos built their labs and began performing tests for companies like Walgreen’s. Eventually it came out that the Edison test Holmes and Theranos claimed was accurate was anything but. Their lab conditions did not meet any sort of standards and they were actually using machines built by competitors, not Edison testing machines. At one point Theranos tried to get a contract with the United States military. Military inspectors found serious problems in Theranos labs and asked the Food and Drug Administration to step in and investigate. This request was denied by Marine Corps General James Mattis. Mattis then retired and took, among other things, a position on the Board of Directors of Theranos. The latest news is that the Centers for Medicare and Medicaid Services is considering banning Holmes and Theranos from owning or operating a laboratory for up to two years. They became embroiled because the company was collecting money from those government services. That’s all background though. What I find interesting is the role of the government in all of this. What Holmes did was clearly dangerous to many people. Patients and their physicians were getting bad lab results and acting in good faith on them. Investors believed the lies of Holmes and gave her a great deal of money. What I want to examine is how Theranos was eventually brought down, or at least curtailed. 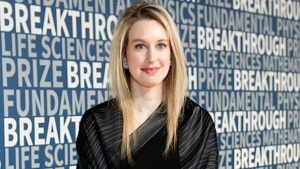 It all started when the Wall Street Journal published an article back in October of 2015 citing many problems in Theranos labs and also numerous inaccurate statements made by Holmes. She claimed partners that did not exist and regulation approvals from the government that had not been issued. Later that month the Food and Drug Administration stepped in because they had not tested the Edison equipment (Theranos was claiming it had been approved). Soon after this Walgreen’s, Safeway, and the Cleveland Clinic Hospital pulled out of contracts with Theranos. This is all good. I’m totally on-board with this. This is government doing what it is supposed to do. It made information available, thanks in no small part to media intervention from the Wall Street Journal, which then allowed businesses like Walgreen’s to make informed decisions. My anarchist friends will argue that the result would have been arrived at without the government at all. My social democratic friends will argue that with all that money involved it was only the government that allowed the story to come out at all, businesses would have covered it up otherwise. To my way of thinking it is the combination of the two that offers the best results. Government gives us pertinent information and lets businesses and people make the final decisions. It’s certainly not perfect but suspect nothing is. Probably a few of you know that I write novels and even fewer that I’ve written a number of screenplays although I’ve never sold any. I was thinking about the changing nature of television viewing habits and how that might effect screenwriters. Many people binge watch televisions shows these days. The industry has recognized this as far a general content goes, they release entire seasons at once and story arcs that cover multiple episodes and seasons are now common. What I’m considering is the idea that the script itself, the order in which things are presented, the nature of the Three Act Play and the Five Act Play might be twisted to accommodate and better entertain audiences in this new era. For example, why do we have a cliffhanger at the end of an episode? 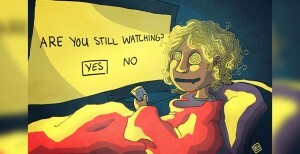 If the audience can and does immediately watch the next episode, is it necessary or even appropriate? The entire season and even the entire show run is really just one long episode. On the other hand, cliffhangers keep the audience coming back for more and if we don’t have them at the end of individual episodes and seasons but in the middle of an episode, would that cause people to not start the next episode or season? Should there even be episodes in the traditional format? Should the season just be released as one long video with chapters like a book? Some chapters might be an hour, others might be fifteen minutes. Perhaps the chapters could come with delineated break points with links to a website where people could post their thoughts, vote in polls, and otherwise communicate with others who have watched up until that break. If the audience doesn’t know when the episode climax is coming, because the break could be at any point, does this add to their experience? There would be drawbacks as well. If an episode is of varying length it’s not as easy to plan a time to watch it. Might inter-season specials be released with audience participation in mind. Perhaps you could release an episode and allow voting to determine the ending. Then go back and film said conclusion. I’m not saying any of my ideas are good, I’m just saying that it’s worth examining.